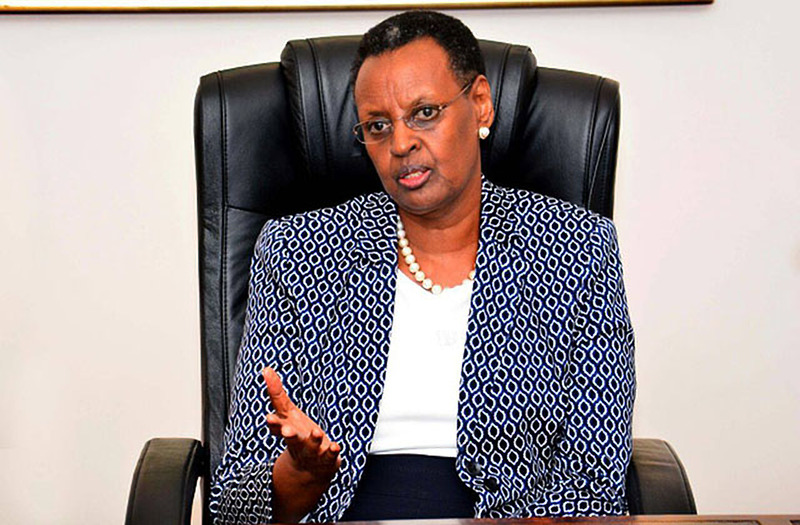 The Minister of Education and Sports, Mrs. Janet Museveni, has warned school managers to stop asking children to report to school at very early morning hours. The minister’s directive comes on the backdrop of media reports which indicate that children have been abducted on their way to school in the week hours of the morning. The First Lady told head teachers to follow the ministry’s guidelines, which state that children have to report to school at 8am and go back home at 4pm. “This is unacceptable and it must stop. The Ministry of Education is now very strict on the time, children should report to school. But parents should come in to implement this,” the First Lady warned. The minister made the remarks after an organized walk, conducted in Kabalagala, a city suburb under the theme “Walk for the Safety of the Girl Child”. The organized Walk aimed at ending gender violence and economic exploitation among slum girls. After the walk, Ms Museveni interacted with some of the slum girls, who narrated to her the challenges they face while going and returning from school. “Boda boda cyclists follow us, throwing nasty words. When we are returning home, we move in dark areas because most roads don’t have security lights,” Harriet Namukasa, a student narrated. On the issue of ending gender violence among girls, Ms Museveni said children are at risk everywhere in Uganda. “This is why local leaders like MPs, district chairpersons and the councillors must get involved in ensuring that the locals know their neighbours. If you start now, it will help the Police to build on it and the area will be safe,” she noted. According to the Demographic Health Survey of last year, 22 per cent of Ugandan women experience sexual violence. According to Mrs Museveni, the vice can be fought if much emphasis is put on building strong families. To empower girl child education, the First Lady offered two university scholarships to girls residing in Kabalangala, a city suburb, to study medicine. Mrs. Museveni also gave out 10 bicycles to girls in the area, who are operating informal businesses. At the same function, the area MP Ibrahim Kasozi asked Mrs Museveni to push for the construction of vocational school in the area, which will train child mothers. Kasozi also asked the Central Government to focus on the city suburbs, arguing that poverty in these areas is at its peak than rural parts. “Many leaders especially cabinet ministers think that everyone in Kampala can afford meals. The true is many of city dwellers dont access safe water, don’t have latrines and get poor education. I even told officials from Prime Minister’s office that Kampala needs specially attention,” Kasozi explained. He however tasked the local residents to engage in economic activities rather than spending much of their time blaming NRM Government. “I caution men around to perform your responsibilities. How can man fails to feed his family and you move around boasting that you are man?” he asked. Kasozi also used the event to donate eight tailoring machines to child mothers. Esther Namboka, the Girls’ Forum International revealed that they are working to ensure that countries have stable families. “But we focus more on reminding parents from vulnerable families to perform their responsibilities,” she added. At African continent, Namboka said Safer Cities for Girls is among the programmes helping girl child. Safer Cities for Girls is under Plan International. The programme is currently running in six cities which include Cairo, Kampala, Delhi, Nairobi, Hanoi and Lima. In Uganda, Safer Cities for Girls, running in three divisions of Kawempe, Makindye and Rubaga.